Home > OptoSigma > OptoSigma 013-1660 Symmetrical Biconvex Lens, 25mm dia. 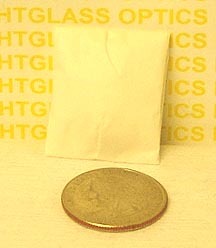 OptoSigma 013-1660 Symmetric Biconvex Lens- 25mm dia. The OptoSigma 013-1660 lens is a Symmetrical Biconvex lens, measuring 25mm in diameter and having a focal length of 26.50mm. Made of Grade A BK-7 Glass and uncoated, it is considered to be most useful when dealing with finite conjugate points. This makes it ideal for 1:1 imaging systems or multi-element setups. OptoSigma rates the clear aperture at greater than 90%, the surface quality 20-10 (scratch/dig), and the Centration at one arc minute or less. New, and still wrapped in factory tissue.